I've been on a real pumpkin kick lately, it's just such a versatile ingredient. Coming into summer here I foresee lots of roast pumpkin and feta salads, while from the northern hemisphere there is sure to be an abundance of pumpkin pie and cake recipes. Bring it on! 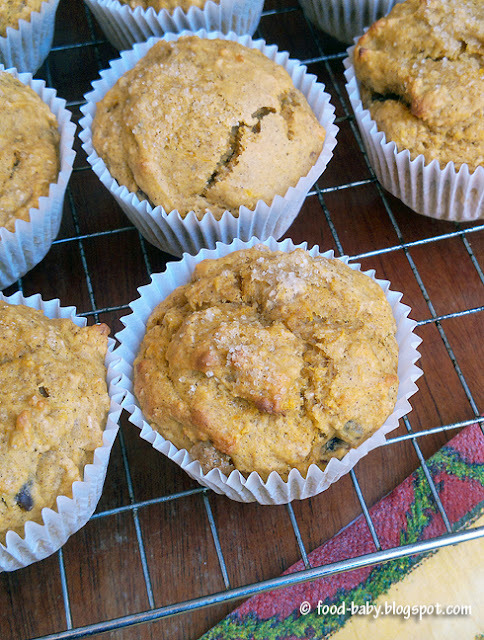 Ever on the hunt for healthy lunchbox ideas for hubby and the boys, I came across these muffins in a healthy lunchbox post on Fig & Cherry. I made a few small changes to the original recipe - using all wholemeal flour instead of half and half. I also added a mashed banana simply because I didn't have quite enough leftover pumpkin and wasn't keen to cook any more. All my boys loved these. I think the banana upped the sweetness a bit and helped them to not be quite so pumpkiny (a bonus for my pumpkin-hating husband). Preheat the oven to 180 degrees (160 degrees fan forced). Line a 12 hole muffin tray with paper liners and set aside. Whisk together the flour, cinnamon and sugar in a large bowl. In a separate bowl, mix the milk, egg and oil together. Pour the wet ingredients over the dry and stir until just combined. Fold through the pumpkin and dates being careful not to overmix. Spoon the mixture into the prepared tray, sprinkle the tops with raw sugar and bake for 18-20 minutes or until cooked. Stand in the tin for 5 minutes before turning out onto a wire rack. Love this muffin recipe. Sounds great!